Chapter 11 - Truth - "Chapter 11 Page 7"
This update was late as heck but…WE HAVE OUR FIRST PATRON CAMEO!! The healer is PK! He’s been a patron for *two years* and I’m SO happy to have put him in the comic! He’ll be here next page too, conversating with Nievu about her health. His one note was to make sure he was short so even Nievu is taller than him if you look at furniture and stuff. PK: You’ve made a remarkable recovery Mage Nievu. Nievu: I am glad to hear. PK: But to tell you the truth… Someone at your level of magic really can’t be so reckless with their drain. 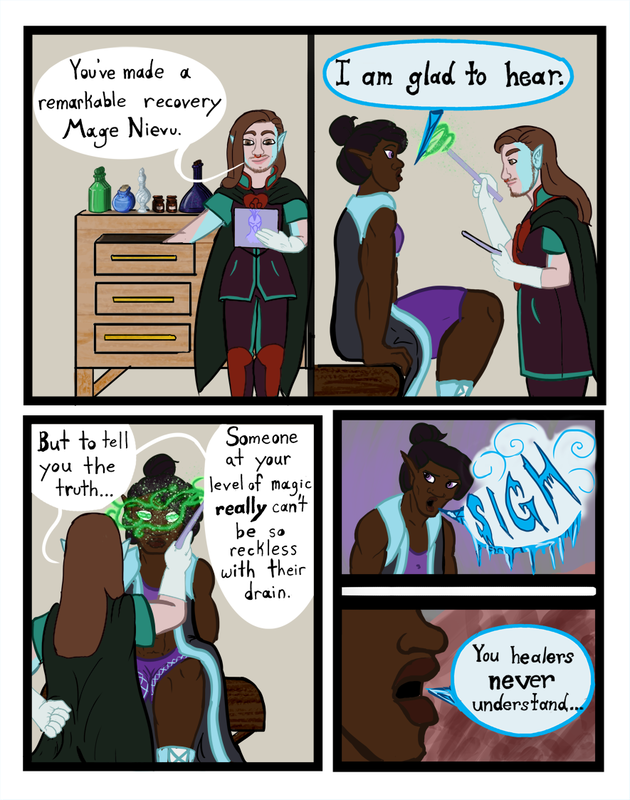 Nievu: You healers never understand.